European fairy folk were transported to Australia in the imaginations of emigrants, but on arrival they cast aside the trappings of the old world and adapted to their new environs. This lecture will examine how fairy-tale motifs and structures were interpreted and transformed to reflect cultural attitudes and the influence of the bush environment in the Australian colonies. Robyn has kindly given us the paper of her talk to share. Steven O’Brien will read an unpublished new tale inspired by Yuletide mythology, as well as reading from his latest book Britannic Myths, a collection of creative retellings of British and Irish myths illustrated by Joe Machine. Steven is the editor of the London Magazine (Britain’s oldest literary journal), and is well known for his fiction, creative nonfiction and poetry. Free and open to all. Contact h.robbins@chi.ac.uk to reserve your ticket. 19 September 2017 marks the 150th anniversary of Arthur Rackham’s birth. Rackham (1867- 1939) was one of the leading illustrators in Britain’s ‘Golden Age’ of book illustration, and his works are still hugely popular today. He is linked to Bateman’s, Rudyard Kipling’s home in Burwash, East Sussex, through his illustrations of Puck of Pook’s Hill, a tale Kipling based on the house and gardens, and to Sussex in general through a number of locations. 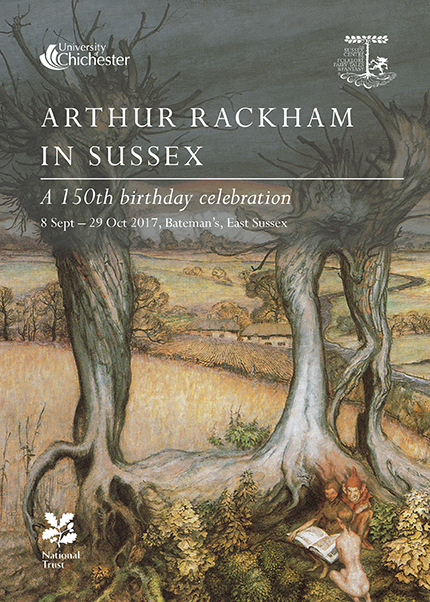 To celebrate, the Sussex Centre for Folklore, Fairy Tales and Fantasy presents this exhibition of Arthur Rackham’s works inspired by Sussex at National Trust Bateman’s, alongside research-led responses to them by Fine Art MA student Emma Martin. 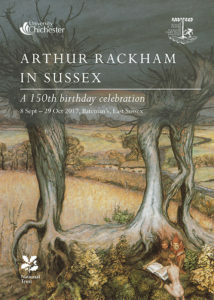 The exhibition will draw connections between illustration, fine art and fairy tales, and the history of the three within Sussex, England and globally. With thanks to the National Trust, the Victoria & Albert Museum, the Chris Beetles Gallery, Brighton Royal Pavilion and Museums, the East Sussex Arts Partnership, the Arthur Rackham Society, the Rudyard Kipling Society, Pook Press and Burwash Parish Council. Research Symposium, Saturday 16 September 2017, Friends Meeting House, Priory Rd, PO19 1NX, 9.30 a.m.-4.30 p.m. Entry £25/£20 concessions. Buy tickets from the University’s online store. Buy tickets to the concert only from the University’s online store. Download the full programme, with venue, accommodation and transport information, plus all abstracts and speaker biographies, here. Saturday 16 September 2017, Chichester Assembly Rooms, 82 North Street, PO19 1LQ, 1-2 p.m. Tickets £7. A one-off musical performance of Friedrich de la Motte Fouqué’s Undine. The story of the romance between a water-sprite Undine and the Knight Huldbrand had a profound influence on the 19th century, inspiring operas, ballets and adaptations, including Hans Christian Andersen’s The Little Mermaid and Dvorák’s Rusalka, as well the imagination of Arthur Rackham. This concert performance will retell the narrative of Undine, interspersed with some of the most iconic musical versions of the story, all set against Arthur Rackham definitive illustrations, as part of a one-day research symposium devoted to Arthur Rackham’s extraordinary legacy. Please feel free to bring food and drink to this lunchtime performance. Buy tickets from the University’s online store. £5/£3 concessions (tickets can be used as vouchers for the book). Free to University staff/students. Contact h.robbins@chi.ac.uk to reserve your ticket. Tickets are £5/£3 concessions or free to University staff and students. Please e-mail h.robbins@chi.ac.uk to reserve your place or with any queries. This event is sponsored by A Chapter Away, residential creative writing courses in south-west France led by authors, agents and publishers (www.achapteraway.com). Please note this workshop is for adults and some content may not be suitable for children. £10/£7 concessions or free to University staff and students. Contact Heather at h.robbins@chi.ac.uk to reserve your ticket. Sue Short is a lecturer in film and media, a research fellow, and writer. Her previous works include Fairy Tale and Film: Old Tales with a New Spin, Misfit Sisters: Screen Horror as Female Rites of Passage, Cyborg Cinema and Cult Telefantasy Series. In this public lecture she will examine how fairy-tale tropes have been reworked in contemporary film, from romcoms to horror movies. Dame Marina Warner, writer and mythographer, will present short stories tinged with fairy tale from her third collection of short stories, Fly Away Home, followed by a chaired discussion and Q&A with the audience. Warner has written several critical and historical books and essays exploring the history of myth and fairy tale. She has been awarded Honorary Doctorates by 11 Universities and was elected a fellow of the British Academy in 2005. In 2015 she was appointed Dame Commander of the Order of the British Empire (DBE) for services to higher education and literary scholarship. Tickets are £5/£3 concessions or free to University staff and students. Prof. Warner will be available to sign copies of Fly Away Home after the event, and ticket prices will be discounted from any books bought at the event. Please e-mail h.robbins@chi.ac.uk to reserve your place or with any queries. Inspired by the folklore and mythology of Sussex landscapes and seascape – and a homage to Kate’s childhood passion for a museum of taxidermy in Sussex – The Taxidermist’s Daughter is a Gothic thriller set in Fishbourne in 1912, as the flood waters are beginning to rise. The Chichester-based best-selling novelist will celebrate paperback publication of her latest No. 1 bestseller by sharing her writing trade secrets: from old legends and ancient Sussex folklore, explaining how her research into taxidermy and bird mythology inspired by novel, and how landscape and Gothic fantasy provide the back drop for creating a novel. A unique event to hear Kate talking in her home town about the novel set in Fishbourne and Chichester. Tickets £5/£3 concessions; free to University staff and students. Ticket prices will be discounted from any books bought at the event. Contact h.robbins@chi.ac.uk to reserve a place or for more information. To celebrate the release of our illustrated map of folklore in Sussex and the South Downs produced with the kind support of the South Downs National Park, the Sussex Centre for Folklore, Fairy Tales and Fantasy is hosting a special celebration of local folktales and songs. Tickets £5/£3 concessions; free to University staff and students. Contact h.robbins@chi.ac.uk to reserve your ticket or for more information. This event is free of charge. If you would like to book a place please email events@chi.ac.uk or telephone 01243 812155/2171. A free networking event for fairy-tale fiction writers/researchers, open to any fairy-tale fiction writers and researchers who wish to attend. The broad topic of discussion will be ‘the enduring elements of fairy tales’. Sherryl Clark, a PhD student from Australia, is visiting the Sussex as part of her research into these elements (what makes fairy tales ‘stick’, as Zipes puts it). She plans to use these elements in four original fairy-tale picture books and a novel for children. The event has been organised to allow her to discuss her topic with other researchers and writers. If you wish to attend, or if you have any queries about the event, please contact Sussex Centre Assistant Heather Robbins at h.robbins@chi.ac.uk. Illustration from ‘Alice in Wonderland’ by John Vernon Lord. A selection of illustrations from Alice’s Adventures in Wonderland and Through the Looking Glass by John Vernon Lord and Mervyn Peake is now on display in the University of Chichester’s Otter Gallery. The exhibition is part of the nationwide celebration of Alice‘s 150th anniversary, and runs in association with the one-day symposium, ‘Wonderlands: Reading/Writing/Telling Fairy Tales and Fantasy’ here at the Sussex Centre on Saturday 23 May. To celebrate Sussex Day 2015 England’s foremost living folklorist, former Folklore Adviser to Terry Pratchett and the Sussex Centre’s Visiting Professor of Folklore, Jacqueline Simpson will present an introduction to Sussex’s folktales. To explore the tales further, a free interactive map of folktales in Sussex and the South Downs will be available to download from today. Tickets £5/£3 concessions; free to University staff and students. To reserve a ticket, or for any queries, please contact Heather at h.robbins@chi.ac.uk. This event is part of the Festival of Chichester. Our events for the 2014-15 academic year are kindly sponsored by www.Zharmae.com – get your fiction fix! The day’s keynote lectures will be given by Prof. Diane Purkiss, Oxford University, who is also a creative writer of fantasy fiction (under the pseudonym ‘Tobias Druitt’), and world-renowned illustrator Prof. John Vernon Lord, whose own version of Alice was published in 2009. The day will close with a series of performances from writers and storytellers which engage with the theme of wonder lands, led by folkloric poet and creative writing professor Dr Steven O’Brien. If you have any queries, please e-mail wonderlands.symposium@gmail.com. Tickets £5/£3 concessions or free to University staff and students; contact h.robbins@chi.ac.uk for more information. Dr Jane Carroll (University of Roehampton), author of Landscape in Children’s Literature (Routledge, 2012) (and formerly Research Assistant at the the Sussex Centre), talks about her research on the role of landscape in children’s fantasy literature, and especially Terry Pratchett’s Tiffany Aching series. Robin Furth, Personal Assistant to Stephen King for five years, and author of The Dark Tower: A Complete Concordance and The Dark Tower: The Gunslinger: The Journey Begins (Marvel Comics, 2011), speaks about her experience of working with King, and translating his fantasy masterpiece into graphic novel form. Prof. Tom Shippey, leading expert on Tolkien and modern fantasy (The Road to Middle-earth, J. R. R. Tolkien: Author of the Century and The Oxford Book of Fantasy Stories). Tolkien made fantasy mass-market in the 1960s. By doing so he consigned a pre-existing fantasy tradition in the USA, not to oblivion, but to the fringes. Fans know about its great authors – Leiber, de Camp, Anderson, Davidson, Vance – but the wider world of films and TV series has passed them by. This is our loss, for the American tradition was and is distinctive, imaginative, and above all funny. This talk will survey it, and make recommendations for unfamiliar but entertaining reading. An illustrated talk by Dr Anne Anderson, Visiting Research Fellow at the University of Chichester, in conversation with Professor Bill Gray, Director of the Sussex Centre for Folklore, Fairy Tales and Fantasy. Hear how the gallery’s exhibition ‘Grimm Girls: Picturing the “Princess”‘ came about, the themes within it and gain some insights into Grimm’s Fairy Tales. Free of charge but please book in advance – email galleryevents@chi.ac.uk or tel. 01243 816098. Monday 25 November 2013, one-day Symposium of leading fantasy and fairy-tale experts.Kindly sponsored by Scrivener. Tickets available from the University’s online store. For more information e-mail scfffevents@chi.ac.uk. Frauke Matz, Lecturer in English at Duisburg-Essen University, Germany, and author of He Simply Went to Pieces, presents this overview of steampunk, cyberpunk, mythpunk, etc. Please note that this event was cancelled due to illness. 2012 is the bicentenary of the publication of the first volume of the Kinder- und Hausmärchen [Children’s and Household Tales] by Jacob and Wilhelm Grimm. As this groundbreaking collection moves into its third century, this conference explores the trajectory of the Grimm phenomenon in Britain and the English-speaking world. Examining the varied and colourful reception history of this collection of tales, this conference will discuss the most recent fairy-tale scholarship, as well as looking forward to possible future developments. The Grimm bicentenary will also be celebrated through storytelling events, readings, a creative writing prize, and an exhibition of illustrations. This conference is being run collaboratively by Kingston University and The Sussex Centre for Folklore Fairy Tales and Fantasy and the University of Chichester. Brian Alderson on ‘The Making of the Kinder– und Hausmärchen’; Neil Philips on ‘The Influence of the Grimms’; Geoff Fox on ‘There’s Game in the Wind’; Nick Tucker on ‘How grim are the Grimms’ fairy-tale parents?’; David Blaimres on ‘The Role of the Forest in Grimms’ Fairy Tales’; Susan Bailes on ‘The Illustrators of Grimms’ Fairy Tales’. As part of the larger Return of the Ring conference at Loughborough University (16th-20th August 2012), celebrating 75 years of The Hobbit, The Tolkien Society is hosting a dedicated postgraduate symposium on Tolkien studies on Friday 17th August 2012. The interdisciplinary symposium is the first of its kind and serves to map current scholarship inspired by Tolkien by bringing together emerging scholars across disciplines of art, cultural studies, fantasy studies, gaming, linguistics, medieval studies, literature, film studies, fan studies etc. Post-doctoral or other early career stages scholars are also welcome. It is hoped that a selection of papers will be published as an edited collection following the symposium. The symposium is led by an internationally renowned team of academics including Professor Martin Barker (International Lord of the Rings audience survey), Dr Dimitra Fimi (Tolkien, Race and Cultural History) and Professor Corey Olsen (‘the Tolkien Professor’). The format of the symposium is based around panels of postgraduate papers and so presents a unique opportunity to hear and be heard by one’s peers across the full range of Tolkien-related study. A networking lunch and an interactive group session, led by the academic team, complement the interdisciplinary approach and students will also have the opportunity to attend the keynote speech by Tom Shippey that evening. Tuesday 29 May at 5.15pm in Cloisters, Bishop Otter Campus, University of Chichester. There will be readings by Steve O’Brien (Editor of the London Magazine, poet and Creative Writing Fellow at Chichester University) of new versions of British and Danish folktales. Prof. Bill Gray will also give a short talk about the history of the word gramarye. Entrance free. Copies of Gramarye on sale (£5). The Folklore Society and the Sussex Centre for Folklore, Fairy Tales and Fantasy are delighted to announce a joint conference on “Folklore and Fantasy” at the University of Chichester on Friday 13th to Sunday 15th April 2012. Many folktales are closely related to the fantastic – through subject matter, content and impulse. Folklore often deals with the fantastic, or turns to the supernatural to provide explanations for extraordinary events. Similarly, folklore has long been a major source of inspiration for fantasy literature, from authors like Kevin Crossley-Holland and Angela Carter and graphic novelists like Neil Gaiman and Bill Willingham who take on and re-present traditional stories, to authors like Lloyd Alexander Susan Cooper, Kate Thompson who draw on established tropes, to authors such as J.R.R. Tolkien, Susanna Clarke and Terry Pratchett who invent their own folk traditions. This three-day conf will explore, investigate and celebrate the relationship between folklore and fantasy. We welcome papers on all aspects of folklore and fantasy from the medieval to the modern and the post-modern. classics of children’s literature including Lewis Carroll’s The Hunting of the Snark. into several languages. His book The Giant Jam Sandwich has been in print for over thirty years. A conference entitled “Mervyn Peake and the Fantasy Tradition” to be held in the University of Chichester on 15 – 17th July 2011, to mark Peake’s 100th birthday and the publication of Titus Awakes, Maeve Gilmore’s conclusion, as she envisaged it, of her husband’s Titus Groan or Gormenghast trilogy. This unsettling and powerful play by Mervyn Peake – author of Gormenghast – is a dark, inquisitive look at the nature of authority and its effect on the human condition. There will be a post-show discussion with the writer’s son, Sebastian Peake, chaired by writer Neil Norman on Tuesday 26 October. Pafiliwn Bont, Pontrhydfendigaid, Ystrad Meurig, Ceredigion, SW 25 6BB. See Festival in the Shire.The Festival in the Shire will be the most comprehensive event ever held for the fans of J.R.R. Tolkien, with a conference, a fan exposition of original art, rare books and memorabilia as well as a large festival with stalls and entertainment. An interdisciplinary research forum and subsequent publication of proceedings (Cambridge Scholars Publishing) based around the currently under-researched notion of the ‘anti-tale.’ The anti-fairy tale has long existed as a shadow of the traditional fairy tale genre. Alongside her paintings Leonora Carrington has also produced an extensive body of writing such as ‘The Debutante’, ‘Little Francis’, ‘The Hearing Trumpet’ and ‘The Invention of Mole’. Her stories are imaginative, surreal, and often funny. The distinguished writer, critic and historian Professor Marina Warner introduces Carrington as a writer.